Teams from across government are making the transition to Inside Government. Robin Riley, HMRC Head of Digital Engagement (and project lead for HMRC on Inside Government), writes about what it was like. Yesterday the corporate web presence of HM Revenue and Customs went live on Inside Government, exactly one year to the day since the beta of Inside Government went live. 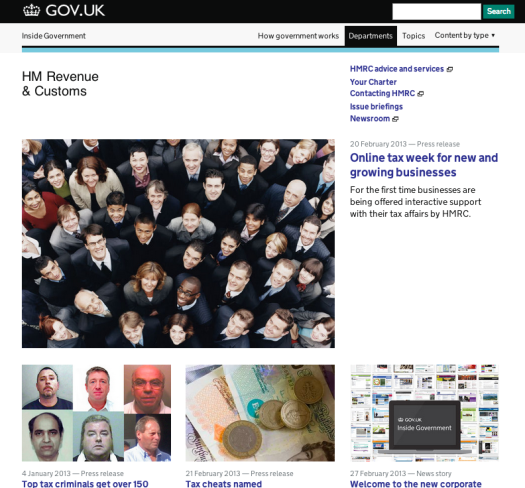 HMRC joins 13 other Departments who have moved across their corporate websites. But I would argue that HMRC has had the longest journey of any Department to arrive at this point so far. Why? Because, bluntly, we started from furthest behind. 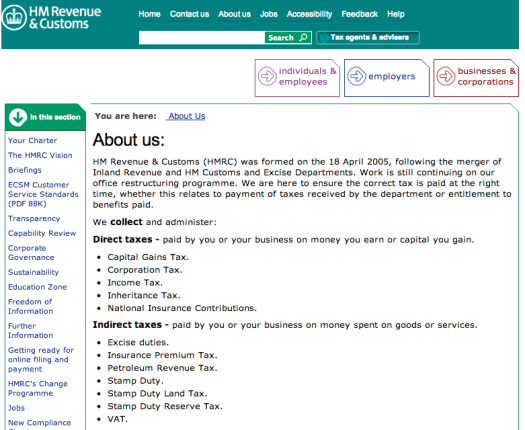 Take a look at the new home for HMRC corporate information, and then take a look back at the old home (pictured above, now archived). We may not have news articles with the global import of the FCO, but news is a simple, accessible way to narrate what we are doing and why. Building our presence on Inside Government has led us to raise our game, putting news at the front. Admittedly, HMRC’s news images are never likely to match MOD’s for visual impact. But they still add value, and the discipline of assembling images for publication over the past year has helped us to think about new ways they can be used. HMRC isn’t quite like other Whitehall government departments; it is a non-ministerial department, with a sharply-focused mission and special governance arrangements backed by law. Does this mean HMRC doesn’t need to put its activities into a policy context to the same extent as the Departments headed up by politicians? Of course not. HMRC is a business with over 30 million customers, annual revenues over £400 billion, and UK citizens - arguably - as shareholders. We have a duty to explain our activities and where they fit into the bigger picture. These examples, and Inside Government as a whole, have one simple overarching aim: better accountability, enabled by better understanding. I can testify that bringing HMRC up to speed to deliver a strong contribution to Inside Government has been challenging. It has meant making fundamental changes to the way we think about our corporate web presence. But the actual transition from our existing website to Inside Government has been relatively painless, even enjoyable. We’ve been fully involved all the way. The move from departmental websites to GOV.UK is very much something that departments are doing - it is not something that is being ‘done to’ departments. 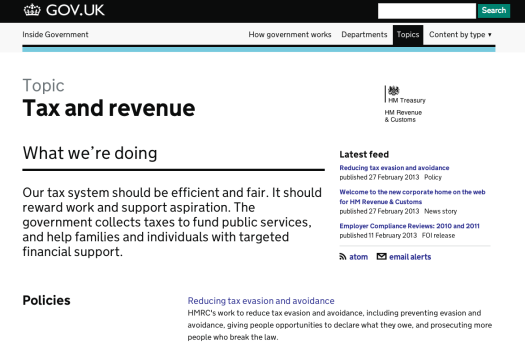 While HMRC’s corporate presence on Inside Government is now live, it is certainly not finished. February 28th did not mark the day HMRC stopped working on the site – if anything, it is the day we began! Please let us have your thoughts and feedback on Inside Government. With your help, we’ve changed our corporate site almost beyond recognition over the past 12 months. What changes should we make together next? I too have yet to understand what GDS is trying to achieve. The existing sites still live and breathe with the essential content. If they continue, then the new government portal will, thanks to Google, often be bypassed so readers can access the material on the department's site. I admire the layout and writing approach on the new portal for simple fact delivery - but the same approach cannot be used to engage and persuade readers. This affects both visual and writing approach. All departments need to use 'selling' and engagement with target audiences at some point or another. Could it be that the online design standard manual will be self defeating? Comprehensive indepth guidance will be too lengthy for access and indepth assimilation by web readers. Content is patchy but good in parts. For example, accessibility of PDFs is briefly flown by. The key question is unanswered - should all government-issued PDFs conform to reading order for audio browsers? If so, will all content creators be trained and equipped with the necessary software? Is the guidance mandatory or optional? Unless resources are made available, departments won't have the financial muscle to implement such laudable goals. Great work so far, but while training government departments I am being asked these perfectly reasonable questions. And I need to know. Could you explain, using HMRC as example, what is "corporate" information and what is not? What is not corporate will still be on hmrc.gov.uk? If not, where? I'm no expert on the subject, but I think the government's "identity assurance programme" is aimed at solving just the sort of problem you've identified. It would help if HMRC accepted this fact, and allowed people to self-serve as one person, wearing many hats. It would help even more if you used your 40 million customers and 5 million other legal entities to influence the rest of Government as well. It would help if I did not have to remember all the different things you have made me do since 2000 and going on-line, and instead just had one easy digital link where I felt in control. At the bank I manage many accounts from one chair at home; HMRC could make my life much easier and so could their influence on others to save us time and money and the public sector ? I’m no expert on the subject, but I think the government’s “identity assurance programme” is aimed at solving just the sort of problem you’ve identified.